The Toyota Camry, the No. 1 selling car in America, will mostly achieve lightweighting and handling targets through higher-strength steel, Camry chief engineer Masatu Katsumata said Monday. 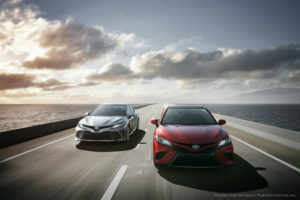 Katsumata said that while Toyota adopted an aluminum hood, it predominantly used higher-strength steels — which also provided better stiffness and handling for drivers. A shift towards the lighter, stronger — but less-sectionable and more heat-sensitive grades of the metal — will demand repairers be fluent in Toyota and steel repair/replace procedures. The Camry isn’t a niche luxury model or supercar — it’s been most common car on the road for more than a decade. Repairer incompetence or corner-cutting on higher-strength steel procedures could have serious ramifications for a big piece of the U.S. fleet if Toyota opted for a similar concentration of higher-strength steels as rival Honda did with the 2016 Civic. Few other details were available about the body’s construction aside from its reliance on the new TNGA architecture, first seen on the 2016 Prius. However, an Aisin representative did tell us it used structural adhesive as well. However, repairers should also prepare for the additional electronics demands, such as calibration, caused by Toyota’s inclusion of the Safety Sense P advanced driver’s assistance systems suite. If the No. 1 car in America can stop itself and offer other features to avoid crashes, that means less volume for shops handling private passenger and fleet work. That could soon be a real hit to frequency — and possibly severity if unavoidable crashes occur at slower speed.